It’s week five of my education in computer programming through Vanderbilt University’s 24-week Coding Bootcamp. Week 1- Here is a list of rooms. Your mission is to take instruction and find the room. Within the room, there will be a hammer and a bunch of errors. Take the hammer and beat yourself with it until the errors go away. Find next room. Week 2- Here is a list of rooms. Find rooms. Locate errors. Beat yourself with the hammer until errors disappear. Week 3- Similar task, only the house with the rooms is a bit more familiar. Upon locating the rooms and the hammer, I find that I can use the hammer as a tool to find the solution and less of an object of destruction, pain, self-mutilation, and humiliation. Perhaps the hammer has a use. Perhaps this object has more use than I originally thought. Maybe the idea is to learn how to use the hammer, or better yet, reach out to others who have beaten themselves with a similar hammer and ask them how to swing it. Week 4- I still need help finding the rooms but when I get lost, I am learning to stay calm and re-trace my steps. I have found the hammer to be an invaluable tool. 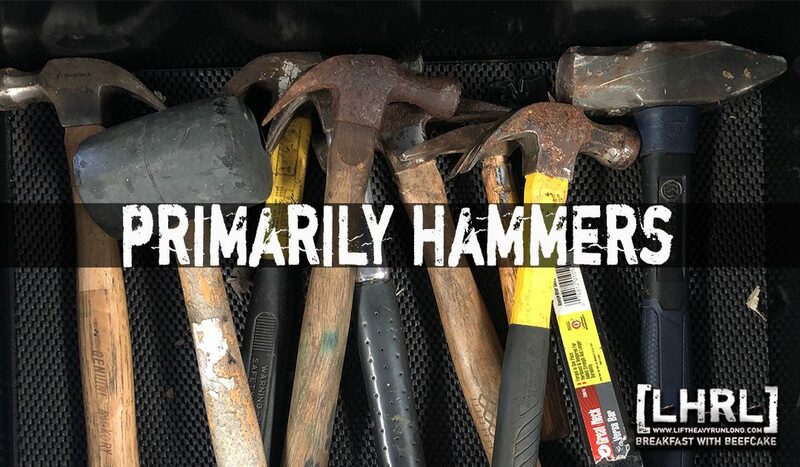 Along with the hammer, there seem to be one-thousand different tools, none of which I know how to use, but I have to believe that there are better uses than beating myself with them. It’s a big house. A huge house with lots of rooms and even more tools. Will I ever learn to use them all? It’s doubtful. But it’s also unnecessary. I think the idea is to learn where to go when there is a need for the tool. It almost seems as if confusion is part of the process. It’s almost as if the feeling of being overwhelmed in a pile of self-doubt is where the gratification can be found. It’s almost as if there is certain knowledge to be obtained if I just trust the process. The rooms without errors are just empty rooms and provide me with no satisfaction. The problem is what makes what I am doing fun to begin with. I have a hard time remembering that. I think the same rules apply to the barbell, the instrument, the algorithm, the sport, or the production. I guess it’s supposed to be confusing, a little frustrating, and a lot of fun. So here we go, into week 5. Another week of problems, solutions, education, and growth. It doesn’t really matter whether I am in a bootcamp or not, life is going to throw those things at me whether I like it or not. The trick is to learn how to use the hammer. Problems, solutions, education and growth.